I’m joking of course, although Rob did say he was interested in hearing Let England Shake. It’s also, being very new (out on Monday) and receiving of gushing press coverage, a very zeitgeisty record right now, and seemed ripe for consumption and discussion. I’ve written about it already on my blog to an extent, so I’ll try not to repeat myself here, and instead add a couple of comments that I mentioned as I introduced it last night. Firstly, there’s a lot of talk about this being a “political” record (yesterday I was in Loughborough giving a talk at a conference, and in conversation with one of the other speakers this record was mentioned, and his first comment was “it’s meant to be political, isn’t it?”), but I think talk of its politics is a misnomer. 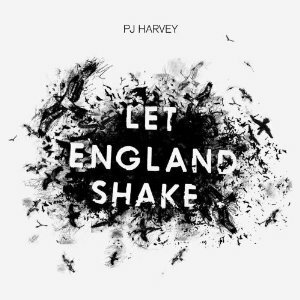 Let England Shake is only political in the absolute broadest possible sense of politics being about people. There is a deliberate narrative distance afforded by the arrangements and (in particular) the vocal performances that, to me, says Polly Jean Harvey isn’t judging the things she is describing them except in, again, the broadest possible sense; these situations are horrific, they destroy people individually and collectively in a literal sense. She offers no solutions, offers no alternatives, doesn’t ask the listener to decline, just leaves a big gap which the listener can fill with… whatever they choose. Which may be a political reading, or a humanist reading, or an ignoring of the lyrics altogether. Secondly, the arrangements here are terrific, and very sophisticated to my ears. The musical appropriations, whether compositional or sample-based, are interwoven in a way that reminds me of Public Enemy: the grooves (whether guitar or drum or autoharp driven) and melodies are appealing, invite the listener in, express an aesthetic (a kind of modern, post-shoegaze folk) that is familiar and comfortable, but the samples and appropriations are so incongruous, so off-kilter, so dissonant in some cases (musicologically or culturally) that they work against that comfort zone, repel the listener, and create a truly compelling and truly weird dichotomy, in much the same ideological way that the sirens and so on in those early PE records seemed like noise but worked like hooks. Melodic references to Surfin’ Bird and Summertime Blues in a “folk” song? Strange. Lastly, I think this record, after a week, is a masterpiece. I find it incredibly moving emotionally, which is why I don’t think of it as a political record. It doesn’t encourage me to postulate or hypothesise; it forces me to empathise, to feel horror, in the juxtaposition of the Summerisle melody and double-thwack round-the-maypole lilt of The Colour Of The Earth with its horrific lyrics of war and loss and the delivery, so removed, so remote, so deadpan, like children 100 years after the fact singing about the black death without knowing what it means and their parents recoiling in horror when the punctum strikes home. Rob listened: This prompted great discussion about the Polly Jean’s place in the pantheon, and in our culture in general. Had she been to the wilderness and back? Had she in fact been making great records all along? If so, why does now feel like a return to the fold, the anointing of a national treasure? Most importantly it sounded like a fine, rewarding album, rich in detail that I’ll look forward to exploring. Tom Listened: I have never bought a PJ Harvey album! There, I said it! I think this is about to change. What a brilliant sounding record. Whereas in the past her power came from being powerful, she seems to have learnt that power can come from restraint too and her voice on this album sounds to me like honey rather than the swarm of bees of old. Nice one Rob Nick. Great choice. Given that PJ’s new album is only 40 minutes long, I was able to pick an individual track to play too. Given Electrelane’s announcement this week that they’ve reformed and arranged a handful of live performances (no mention of an album yet, but I live in hope) it seemed timely to pick this tune by Brighton’s finest all-girl krautpoppers. A bridging single between their debut and sophomore records, it marks the first time Electrelane used vocals in a song, and as such is something of an epiphany moment for them. It also, being produced by Echoboy (ex of The Hybirds), adds an electro-pulse to proceedings which is atypical of their later, Steve Albini-recorded sound, but still very much identifiable as Electrelane. One of my favourite bands of the 00s. In yet more flagrant disregard for the rules, I forced a second song selection on the DRC, and played this beatific b-side to the ravenously extreme Come To Daddy single. It does, indeed, move me in ways that nothing else moves me, both emotionally and physically – head-nodding has been known. Aphex Twin is known for his technical nous regarding beats and constructions, but for me his real genius is melodic; the Richard D James album achieves the same kind of push-me-pull-you dichotomy as discussed regarding the samples on the PJ Harvey album, juxtaposing sweet, childlike melodies with jackhammer beats. The beats here are less frenetic, but still offer a stark contrast to the beguiling melodic manoeuvres. Flim manages to be both uplifting and mournful and kinetic and blissful all at the same time. It’s a trick that’s fascinated and enchanted me for nigh-on 14 years.